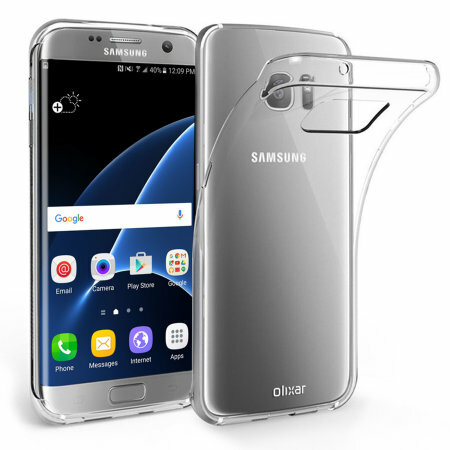 Custom moulded for the Samsung Galaxy S7 Edge, this 100% clear Ultra-Thin case by Olixar provides slim fitting and durable protection against damage while adding next to nothing in size and weight. It does the job nicely just what I wanted. This phone cover is so slim. You would hardly know it's there at first glance. Delighted with it! This is a Christmas Present so I cannot comment on the actual item, but the service and delivery from Mobile Fun has been excellent. Really pleased with my purchase. If I didn't know the cover was there I wouldn't know that the cover was there. Fits like a glove!! Product arrived today, fits the phone like a glove. This case is super this! One of the thinnest cases I've ever owned and I love it, hands down my favorite minimal and low profile case for the S7 Edge! I highly recommend buying this case and get this great price from MobileFun! Good looking, simple case. I recommend to buy 2 per year of use to maintain fresh look since the plastic seems a bit too soft to last. I am using it only for a month, and may need to change this review in 6 month time. The Olixar ultra thin case for the S7 edge is hardly noticeable on the phone and does not obscure the edges. This case is great if you want some protection from scratches but want to be able to see the phone in all its glory. There isn't very much lip top and bottom, if you carefully place the phone screen to the surface then it would be ok as long as the surface is smooth, if you are careless with the phone this case probably won't stop the screen from getting scratched. The case can be taken off and put on very easily and I haven't experienced the case coming off when pushed into pockets or bags over the 2 weeks I have been using it. Perfect case if you still want to keep to beautiful design of the phone! After relinquishing (not extinguishing...fortunately) my beloved Note7 back to Samsung and taken possession of a S7 edge, I was looking around for a similar case for my new S7edge but obviously without the fire retardant qualities. Was surprised to observe that the official Samsung S7edge clear case looked a bit bulky, and didn't appear to provide 100% protection from MTDs (mobile transmission diseases) so I ordered this one and to my relief it's an almost identical smug fit as the official clear case for the Note7, and obviously keeps my lovely gorgeous S7edge free from nasty germs (and any exploding Note7s in the vicinity). It looks almost as not there! Great cover, does exactly what it says with the added advantage of being almost imperceptible. Fits like a glove. I bought this because I wanted to still be able to see the beauty of my phone but although it does this I guess most like me would not have a screen exposed on a £550 phone. The problem is with the lovely curved edge. Unfortunately the case pushes the screen protected off meaning that I has to discard the sreen protector and case and opt for a flip close case. Not my preference but no other choice with this phone in my view. Bought this case as is relatively low cost and slim (didn't want to ruin the lines of the S7). First impression is that the case is very well priced and the quality is good. It covers the back of the S7 well and all necessary cut-outs line up with the headphone jack etc. The case itself is thin, somewhere between a standard case and a stick-on jobby. The camera - although now almost flush with the back of the S7 is protected from desk scratches and similar. On the front the case is slightly higher on the top and bottom of the device so allows for a small buffer when placing the phone face down. The edge screen is still fully accessible and all buttons can still be pressed with ease. What I will say is a strong positive for the case is that its difficult to see that's it even on the device, partially down to the clear rubber material, but also because the form factor is great. From a distance you really couldn't tell. Another positive is the grip - which with a polished S7 can be tricky - but with the case it sticks in the hand. This case has already proved its worth with a drop onto a patio - no damage to the phone - highly recommended. It is excellent to have simple cover for phone galaxy 7 edge. I dont like some character cover or colourful ones but this transparent can show the original colour of my phone. Only had this a few days so an early assessment that might change over time. I wanted something that would not obscure the design or change the handling of my device, I.e. the very reasons I had chosen the phone in the first place. I needed something to protect and to reduce the slipperiness of the phone. Most cases and covers are clumsy or opaque, and the handling quality of the device changes for the worse. This OLixar cover completely fits the bill. Once it is in place, you can hardly tell the difference from the original look and feel of the phone while reducing the slipperiness. It preserves and shows off the design, whilst keeping the back scratch free and the label with serial numbers etc covered from any potential damage or wear-out. The main things that can't yet be rated are whether the material will stand the test of time without becoming too scratched or opaque, and whether it will still fit as tightly as it does at the moment. CLearly, this cover is not particularly meant to be shock proof or protect from impact etc., but if you want those qualities, you will have to accept the ugliness of most of its competitors. Fantastic! Great quality, perfect fit. Thanks! Would have preferred to know beforehand that the item was shipping from the UK and not Australia but I was happier just having been able to find a case for the S7 Edge that was under $100! This is the only simple case I could find for this phone and it's perfect. Thanks! I wouldve wanted 2+ photos of the product on the phone to know what it looks like. But other than that, it fits really well and it's not bulky at all. The new Galaxy S7 Edge is a smooth piece of phone. So smooth in fact, that a small slip from one's hands, and one would in-advertently do a drop test with the new shiny phone. This product, allows me to have a better grip of my phone, without adding to the weight or size. Thus, excellent piece of product. I bought a clear cell phone case for a Samsung Galaxy 7 Edge. It doesn't offer any protection if it's dropped but does show off what a beautiful phone it is. It took almost 2 weeks to get it in the mail. Other than the wait, I like the product. Product which i ordered its just like i was expecting. Very gast service even during Easter. I purchased two cases from MobileFun. Great prices, fast shipping excellent communication. This particular case didn't work out for me. I wanted something low profile and it fits the bill, but the material comes off to easy especially when the phone is hot. To bad because I like how slim it is. This no-frills anti-slip cause for the S7 Edge does exactly what it says on the tin. It fits closely to the back of the phone without overlapping the all-important edge regions of the display and provides a reassuringly good firm on your brand new S7. This is doubly good since the S7 edge has performed rather badly in drop tests against the Apple iPhone 6S. The case is completely transparent which allows you to admire the sleek golden back of the phone, glossy and attractive in texture with a dimpled inner surface to firmly grip the phone. My only slight niggle with it is that, being of very soft material, it sometimes does slip off a little bit, unsurprising given the extremely small amount of purchase afforded by the edge's form-factor. If you want a good value case that prevents drop page, get this, if you want a more enclosed case, get something else. I find it difficult to evaluate this product as it isn't the type of cover I would choose. It however seems to be very adequate in affording protection for the phone. Personally, I prefer the leather bound case and am awaiting it's replacement a.s.a.p. Great product, slick and thin but strong case! The product is great. The delivery was on time as expected. All around I am happy. The case is nice and compact and doesn't bulk out the phone. The feel of the case is good and isn't as slippery as the phone case, so less chance of the phone slipping in the hand. Haven't dropped my phone on a hard surface yet so i don't know how good the protection is. Corners of the case do cover the phone so might help in protection of phone if it is dropped. I bought 2 case and have given one to a friend who is well pleased.